We’d love your help. Let us know what’s wrong with this preview of Kill Fee by Owen Laukkanen. The new Stevens and Windermere novel from one of the most dazzlingly acclaimed new writers in crime fiction. The billionaire picked a heck of a way to die. On a beautiful Saturday in downtown Saint Paul, Minnesota, state investigator Kirk Stevens and his occasional colleague FBI special agent Carla Windermere witness the assassination of one of the state’s wealthiest men The new Stevens and Windermere novel from one of the most dazzlingly acclaimed new writers in crime fiction. On a beautiful Saturday in downtown Saint Paul, Minnesota, state investigator Kirk Stevens and his occasional colleague FBI special agent Carla Windermere witness the assassination of one of the state’s wealthiest men. The shooter is a young man, utterly unremarkable—except in his eyes. There is something very wrong in his eyes. To ask other readers questions about Kill Fee, please sign up. Steven No, Malcolm Lind did on the order from Killswitch. Parkerson was afraid that Cody would eventually give them up. This, the third novel in the Stevens-Windermere series, begins with the two protagonists, Minnesota BCA agent, Kirk Stevens, and his occasional partner, FBI agent Carla Windermere, enjoying a cup of coffee and a quiet conversation in a St. Paul park. They casually watch a luxurious Bentley sedan pull up in front of the hotel across the street from the park and speculate about who might be in it--Prince, maybe? They watch as an elderly, white-haired man steps out of the car. An instant later, the This, the third novel in the Stevens-Windermere series, begins with the two protagonists, Minnesota BCA agent, Kirk Stevens, and his occasional partner, FBI agent Carla Windermere, enjoying a cup of coffee and a quiet conversation in a St. Paul park. They casually watch a luxurious Bentley sedan pull up in front of the hotel across the street from the park and speculate about who might be in it--Prince, maybe? They watch as an elderly, white-haired man steps out of the car. An instant later, the man is shot by a sniper and with that, Stevens and Windermere's relaxing afternoon is pretty much at an end. The two race into a tower across the street from which the shot was fired and catch a brief glimpse of a slight, brown-haired man descending the steps as they are racing up. Only a few minutes later do they realize that the man they saw was the shooter. Windermere gets a closer look at the guy in a parking lot a few minutes later and is momentarily frozen by the vacant look in his eyes. Looking virtually straight through Windermere, he casually gets into his car and drives away. Windermere is unarmed; all she can do is note the license plate and watch helplessly as the killer escapes. But with that, the story is off and running at a frantic pace that refuses to allow Stevens, Windermere or the reader any sort of a break over the course of the next 490 pages. In addition to creating two very appealing protagonists, Laukkanen excels at inventing truly interesting and compelling villains, as he demonstrated in both The Professionals and Criminal Enterprise. In this case, a shadowy businessman has created a website called Kill Shot, in which customers can conveniently order a murder on line. The executive recruits and "trains" ex-soldiers who are suffering from PTSD to actually carry out the killings, and neither the executive or his agents are leaving Stevens, Windermere and the rest of the authorities any sort of useful evidence that might help them break the case. It's another page-turner from Laukkanen, with well-drawn settings, an intriguing cast of characters, and a clever plot that moves at the proverbial break-neck pace. And as it does, the relationship between Stevens and Windermere becomes increasingly interesting. Windermere is a very attractive African-American woman, ten years younger than her partner. Stevens is married to a beautiful, intelligent woman, who is almost too perfect and too understanding to be believed--especially when it comes to her husband's relationship with his F.B.I. partner. Notwithstanding that, there's clearly a growing sexual attraction between Stevens and Windermere and the question of how the two will deal with it constitutes an interesting subplot. All in all, Kill Fee is another very entertaining novel from a writer who's clearly establishing himself as one of the best new thriller writers on the scene today. Owen Laukkanen has established himself as a writer to read with original plots and diabolical villains. His police investigations are action packed engrossing reads featuring the unusual pairing of Minnesota State Investigator Kirk Stevens and FBI special agent Carla Windermere, who must find the killers before they strike again. His debut novel, "The Professionals" about erudite businessmen who get into the kidnapping racket was a tour de force. His last book, "Criminal Enterprise" explored a b Owen Laukkanen has established himself as a writer to read with original plots and diabolical villains. His police investigations are action packed engrossing reads featuring the unusual pairing of Minnesota State Investigator Kirk Stevens and FBI special agent Carla Windermere, who must find the killers before they strike again. His debut novel, "The Professionals" about erudite businessmen who get into the kidnapping racket was a tour de force. His last book, "Criminal Enterprise" explored a bank robber's descent into evil, when he tries to keep up his lifestyle after being laid off from his job. In "Kill Fee", Owen Laukkanen's latest cop - crime thriller, Stevens and Windermere, are at lunch when they witness the assassination of a billionaire. Although Stevens and Windermere give chase they cannot capture the dead eyed assassin. A few days later, the billionaire's cousin is also killed. Stevens, the cop with golden instincts, is tasked by his boss, to protect the family and find out how the two men died. The investigation is complicated by the fact that the two men have nothing in common. He and Windermere join forces and try to track the killer before he strikes again. There are showdowns in Miami and clues at rental car spots. Laukkanen does not completely depend on suspense. These novels are about both the criminals and the cops. So we soon meet the assassin's shrewd employer, a diabolical businessman, who has started a murder for hire business. His killers --young soldiers fresh from the Iraq War, who he molds and tortures until they are little more than unapologetic killers. But Lind, his current killer for hire, is starting to feel something. He has met a girl, who cooks him spaghetti. Laukkanen, also explores in more depth the uneasy relationship between the married Stevens, who loves his wife, and the single and beautiful Windermere, who are attracted to each other. This relationship forms the emotional heart of the novel, but the main star of this roller coaster ride of a novel is their efforts to find the killers before they strike again. Can Stevens and Windermere figure out the fiendish plot and track Lind and the businessman before they kill again? Help will come from unexpected quarters, but there will be more bloodshed, murder and plenty of action along the way. The book is too long (for me). I should have followed my instincts and given myself more breathing room after reading the boating book by this author, but since people (reviewers) like his Stevens & Windermere series I downloaded a couple of them from the library. This is pretty much all I need to read of this duo (Female FBI Windermere and MN State cop Stevens). I do try to visit books based in Minnesota where I was born, but I rarely enjoy them. The main complaint for me is that it reads l The book is too long (for me). I should have followed my instincts and given myself more breathing room after reading the boating book by this author, but since people (reviewers) like his Stevens & Windermere series I downloaded a couple of them from the library. This is pretty much all I need to read of this duo (Female FBI Windermere and MN State cop Stevens). I do try to visit books based in Minnesota where I was born, but I rarely enjoy them. The main complaint for me is that it reads like a television series or movie script with all the blanks filled in for couch potatoes. That is just not my thing. Story here: a very evil man who manages to live a "normal" executive family man lifestyle PLUS grab soldiers traumatized with injury and PTSD after war experiences right out of the veteran's hospitals and into his prison of privation at a lakehouse to train them to be killers. He has the computer skills to set up his virtual network to arrange kills for hire. He then sends out his trained brainwashed drones. Book three in the Stevens/Windermere series, and another winner. Laukkanen sure knows how to write a great story. Stevens, who is a BCA agent, and Windermere, who is FBI, combine to make an amazing crime fighting duo. Disclaimer: I received a copy of this book from the goodreads giveaway. Kill Fee – Book 3 in a series. The title of this book should be changed from Kill Fee (which just sounds plain weird to my ears when said out loud) to Kill Switch. A very fast and engrossing read with a terrific plot line. That being said, I found it difficult to believe in the attraction the two main characters had for one another, especially given that one of characters is supposedly happily married to an attractive wife. I Disclaimer: I received a copy of this book from the goodreads giveaway. I'm designated 3.5 stars on this one, as I enjoyed this, but I found it a bit of step down from the first two. The main characters - Stevens & Windermere - are two of my favorites. Laukkanen doesn't write procedural crime books - these two sometime partners from Minnesota, get involved in cat and mouse cases with pretty diabolical criminals. This particular case has a lot less credibility, in my opinion, than the previous two. However, the action gets going quick. The two agents are enjoying a cup of coffee when they witness a billionaire in St. Paul get murdered. It thrusts them on the case, and they work tirelessly but remain steps behind for most of the story. There's been tension between the two main characters from a romance standpoint. This is explored a bit more here - as Stevens is married, but dealing with the issue of being around Windermere more than his wife and family. I like how Laukkanen handles the two, and keeps their humanity and likability at high levels as they honestly deal and question feelings and emotions with one another. Kill Fee, the 3rd entry in the Windermere/Stevens series by Owen Laukkanen, is a nice thriller with a plot that's a little 'out there', decent writing, believable dialogue, and a little too much focus on the competition between Windermere's male counterparts for her attention. I think the dialogue is a strength of the series, seemingly patterned after John Sandford's work in the long-running 'Prey' series, but its weakness is on the procedural side. The plot is interesting: a man sets up an Uber Kill Fee, the 3rd entry in the Windermere/Stevens series by Owen Laukkanen, is a nice thriller with a plot that's a little 'out there', decent writing, believable dialogue, and a little too much focus on the competition between Windermere's male counterparts for her attention. I think the dialogue is a strength of the series, seemingly patterned after John Sandford's work in the long-running 'Prey' series, but its weakness is on the procedural side. The plot is interesting: a man sets up an Uber-like 'murder for hire' site using ex-military personnel with psychological problems as his killers. Assassinations occur, one of which right in front of FBI agent Windermere and state cop Stevens as they sit on a park bench 'catching up'. Before you know it, the team is back at it, trying to figure out the links between seemingly un-linked murders. They eventually put it together, though the work seems to be impeded a bit by the relationship between the main characters and the romantic interest in Windermere shown by her junior partner, Mathers. Eventually, the good guys win and the only semi-sympathetic character among the 'bad guys' chooses to do the right thing at a climactic moment and makes it as much of a 'happy ending' as you could hope for in a book about serial killers. - Why do the FBI people give up so easily when they reach an impediment? If another government or law enforcement group won't cooperate (TSA, for example), I'm sure there are ways to escalate issues. Another example is the ammunition supplier..... there were a limited number of addresses they shipped one-time orders to, yet the FBI never asked for them because the company said they needed a warrant. - The team constantly is wasting time flying out to crime scenes or to investigate leads that seemingly could be handled via phone or keyboard. A bunch of fake names are used by the Killswitch owner and his killing crew, yet rather then getting into various databases to check out the names and photos of the real owners of the names they hop flights, pull people in for questioning, etc. - Why did they wait until the end to figure out how a DoD server can be used for the Killswitch site? - Windermere, the all-star FBI agent, is a great physical presence but the real thinking to crack this case seems to be done by Mathers and Stevens. The opening line was a simple statement. Immediately the reader was lulled into a casual walk with a couple enjoying a beautiful day and light bantering only to be startled out of this daydream state by a gunshot and screams as people dived for cover. Carla Windermere and Kirk Stevens, the couple were trained for this type of reality – a sniper, a murder, an investigation. That simple statement foretold the beginning of a mystery filled with many twists and near misses it looked like it may neve The opening line was a simple statement. Immediately the reader was lulled into a casual walk with a couple enjoying a beautiful day and light bantering only to be startled out of this daydream state by a gunshot and screams as people dived for cover. Carla Windermere and Kirk Stevens, the couple were trained for this type of reality – a sniper, a murder, an investigation. That simple statement foretold the beginning of a mystery filled with many twists and near misses it looked like it may never be solved. Working as a team for the FBI and the Bureau of Criminal Apprehension, Carla and Kirk were led on a chase so vastly complicated with puzzle pieces seemingly unconnected and diabolical; it seemed impossible to conceive. Fast paced with short chapters, pleasing to the eye print and crisp sentences made “Kill Fee” a page turner to the end. Constant intensity level made visualization easy for the reader. Layered development of characters gave a full insight to their lives creating a sense of believability and vulnerability maintaining the reader’s interest. Exploration of working relationships added dimensions to the characters. The use of veterans, internet cloaking software, and brainwashing within the framework of the story made “Kill Fee” contemporary and connected emotionally. “Kill Fee” was truly unique and enjoyable to read. This review was based on the uncorrected proof received free from Goodreads First Reads. Laukkanen's third effort is a compulsive read, in spite of a plot that strains credibility, and a disturbing and unfair stereotyping of U.S. war veterans. The protagonists - an unlikely pair comprised of a Minnesota state cop and female FBI agent - chase the bad guys all over the country in an effort to end a serial killing spree. The chase, coupled with a love (lust) triangle, will keep you turning pages late into the night. I again enjoyed Owen Laukkanen's Windermere and Stevens pairing, their 3rd outing together. Minnesota State Police investigator Stevens and FBI agent are thrown together for this investigation when they witness the murder of a prominent Minnesota businessman while meeting for lunch. The killer is seen by both agents, but escapes. The subsequent murder of another of that businessman's relatives, and then a killing in Miami meeting the same MO, leads to a cross country chase a set try to both iden I again enjoyed Owen Laukkanen's Windermere and Stevens pairing, their 3rd outing together. Minnesota State Police investigator Stevens and FBI agent are thrown together for this investigation when they witness the murder of a prominent Minnesota businessman while meeting for lunch. The killer is seen by both agents, but escapes. The subsequent murder of another of that businessman's relatives, and then a killing in Miami meeting the same MO, leads to a cross country chase a set try to both identify the killer, and to catch someone whose organizational ability seems to not match the killer's actions. These days everything is available on the web, and if you know where to look and have enough money you can even arrange the murder-for-hire firm of KILLSWITCH to get rid of those unwanted people in your life. This fact is brought to the attention of FBI Agent Carla Windermere and BCA Detective Kirk Stevens when on of KILLSWITCH’s target falls to the ground in front of them. Forced to team up once again, they begin the investigation that quickly turns into the proverbial search for the “needle in These days everything is available on the web, and if you know where to look and have enough money you can even arrange the murder-for-hire firm of KILLSWITCH to get rid of those unwanted people in your life. This fact is brought to the attention of FBI Agent Carla Windermere and BCA Detective Kirk Stevens when on of KILLSWITCH’s target falls to the ground in front of them. Forced to team up once again, they begin the investigation that quickly turns into the proverbial search for the “needle in a haystack”. This is Mr. Laukkanen’s third book featuring Windermere and Stevens and each of his books keeps getting progressively better. They are action packed, clever, and current. Windermere, as the young “super-agent” plays very well against the older and more seasoned Detective Stevens. The story line of Mr. Laukkanen’s books could well be the headline in tomorrow’s paper, only, made more interesting by the reader being involved in the chase. His “bad guys” are original, which is a difficult thing to say when you read as many crime thrillers as I do, but he really does manage to pull it off. They are always ordinary folks who have a brilliant, albeit, illegal idea to make a little extra money … college student kidnappers, basketball coach bank robbers and now a government employee organizing “hits”. Unfortunately, the schemes always seem to get away from them in one way or another and they wind up in over their heads. It’s worth mentioning something else Mr. Laukkanen always manages to do, unbelievably, make me feel sympathy for one of the antagonists. I always get the “Ah geez” feeling close to the end of the book. I always want the “bad guy” to be caught, yet am cheering for him at the same time. Now that’s quite an accomplishment. I would highly recommend Mr. Laukannen to anyone who is a fan of crime thrillers. He certainly manages to do it right. 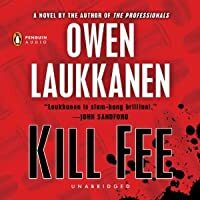 I won a copy of "Kill Fee" (Stevens & Windermere, #3) by Owen Laukkanen through the Goodreads Giveaway Contest. This is a fast-paced thriller, but the first one I have read, but this book works well as a stand-alone read. This novel is peopled with sharp, intriguing characters and more twists and turns than a corkscrew. Carla Windermere, a black young FBI woman and her on again/off again partner Kirk Stevens, a older BCA agent, the "odd couple", sat down on a park bench, enjoying a coffee on I won a copy of "Kill Fee" (Stevens & Windermere, #3) by Owen Laukkanen through the Goodreads Giveaway Contest. This is a fast-paced thriller, but the first one I have read, but this book works well as a stand-alone read. This novel is peopled with sharp, intriguing characters and more twists and turns than a corkscrew. Carla Windermere, a black young FBI woman and her on again/off again partner Kirk Stevens, a older BCA agent, the "odd couple", sat down on a park bench, enjoying a coffee on sunny day in downtown Saint Paul. A perfect day...and then a shot, a sniper, a murder, and then begins an investigation, with more deaths to follow. Working as a team for the FBI and the Bureau of Criminal Apprehension, Carla and Kirk were led on a chase of their lives. Without giving too much away,this novel is about a contract killer, a serial killer, a online crime web site account referred to as "Killswitch",and war veterans with psychological issues, a contemporary and thought provoking novel. I believe the title of the book should be changed from "Kill Fee" to "Kill Switch", which is more in tune to the substance of the novel. Fast paced with short chapters, pitch perfect, solid characters, unpredictable twists and excellent plotting; a must -read for those who enjoy crime fiction. As inconsequential and trite his characters and plotting are, at least Laukkanen is a concise, clean writer. Chapters come at you fast and quick, almost none longer than a single page (and several far shorter than that), keeping the action bits coming fast and lean. His style may be the problem, however, as the machine gun-style pace doesn’t allow for detailed analysis or anything resembling an understanding of the material above the most superficial level. Kill Fee isn’t a bad book, but it’s no As inconsequential and trite his characters and plotting are, at least Laukkanen is a concise, clean writer. Chapters come at you fast and quick, almost none longer than a single page (and several far shorter than that), keeping the action bits coming fast and lean. His style may be the problem, however, as the machine gun-style pace doesn’t allow for detailed analysis or anything resembling an understanding of the material above the most superficial level. Kill Fee isn’t a bad book, but it’s not a very good one either. It just exists, and nothing more. FBI Agent Carla Windermere and Minnesota State Policeman Kirk Stevens are in the middle of lovely conversation one day in a park when they witness the murder of a wealthy media executive across the street. They pursue the gunman, a sniper, through the streets, but Windermere is so disturbed by young killer’s appearance that she falters, and the kid gets away. Windermere and Stevens are then drawn into a convoluted hunt for an entity known as Killswitch, a person or organization that organizes hits for money. After failing to track the shooter down thanks to a clever alias trick involving rental cars, Windermere and Stevens are forced to wait until the next hit before they take action. The trail leads them to Miami, where an importer meets his unfortunate end during a contract negotiation on a lovely yacht. Again, the shooter gets away before Windermere and Stevens can catch up. But the kid doesn’t escape of his own volition. Somebody helps him. The next Killswitch hit in Vegas gives the team their biggest lead — because it fails. The disturbed young kid can’t bring himself to kill his target. Unfortunately, Killswitch doesn’t give up so easily, and another hit man is sent, who completes the mission. But Windermere and Stevens are present, and they manage to find themselves a witness — who was unfortunately hit by the hit man’s car during the getaway. The witness tells Windermere and Stevens that two people were in the car. The chase eventually leads the team to Philadelphia, where Killswitch has turned on the disturbed kid for his failure. His replacement attempts to murder the kid in his apartment, but the kid manages to escape with his only friend in tow, a young woman. The replacement chases them into Delaware, but after a couple of confrontations, the kid and the woman escape. The kid eventually drops the woman off at a police station to let her tell the story and inform the police where the former assassin is heading: a lake house in North Carolina, the home base of his employer. Windermere and Stevens are, thankfully, in North Carolina. Using the descriptions from Miami and Vegas, they track down the mysterious second man, a defense contractor. They attempt to confront him at his home, but he escapes to his home base lake house before they nab him. Unfortunately for the man, Parkerson, his two hit men “assets” have broken their “programming” and turned on him. As the police close in, he kills the replacement and flees, but he ends up running into the kid, who managed to find his way “home.” Parkerson is shot dead by his own hit man, who then surrenders to Windermere and Stevens. The kid, who was brutally brainwashed by Parkerson, ends up in a psych ward for treatment and is reunited with the family he’d forgotten he had. His young woman friend also pays him a visit. Stevens and Windermere find themselves back on the same bench from the book’s opening, discussing their partnership and what it means for future cases. All the bad guys die. All the good guys live. This book took me forever to read. Not because it was bad. It was just long. I thought this book had a lot going for it. The characters, both the protagonists and antagonists, were interesting and fully fleshed out. The book switches between multiple POVs so the reader gets to understand the motivations behind the actions of all the major forces, which I felt was a good move considering the setup of the storyline. The plot moves along at a pretty quick pace, although I did find it irritating at times. The chapters are so short that I could never find a natural stopping point. I always had to stop in the middle of something important — that probably sounds like a stupid criticism, but it did negatively impact my reading experience. The book read like a race instead of roller coaster; there were no ups and downs. It was all the same, fast pace, amplified by the structure. The story moves through several different settings, and while a couple of them seemed pretty generic (hotels and the like), the shifting surroundings for all the similar dangerous situations kept the plot points pretty fresh throughout. Overall, the world-building was solid. Mostly, I thought this was a good read. Great characters. Good storyline. Iffy structure. Lots of third person POVs. Five or six? The author did a pretty good job giving each of the characters a distinct voice, so the frequent POV changes were easy to follow. The general writing style wasn’t anything special. Lots of dialogue. Lots of internal thought. Lots of action. Pretty standard for a crime thriller. Yeah, if you like fast-paced crime thrillers, this is a book for you. Be warned, it is the third in a series, although you don’t need to read the other two to understand this one. I haven’t. In fact, I didn’t know it was a series until today, when I looked the book up on Amazon. Huh. I had my suspicions, given the reference to past events, but the book never read like it required former installments to “function” properly. I think it’s safe to say you can read this series out of order and not be lost. Anyway, decent thriller. Pick it up if that’s your thing. James Patterson and John Sandford have new competition! I recently read Owen Laukkanen's 3rd book -- now I'm going to have to track down all the other titles. I really love these Stevens and Windmere books and put Laukkanen on my list of favorite authors. There is nothing fancy or overly complicated about them. Just sleekly plotted novels involving crimes generally perpetrated by every day people that take a bit of ingenuity to catch up with the criminals. You really get a feel of how FBI agents think in order to stay ahead of the criminals. Like author James Patterson (and probably a host of other authors), each chapter is generally no more than 3 pa I really love these Stevens and Windmere books and put Laukkanen on my list of favorite authors. There is nothing fancy or overly complicated about them. Just sleekly plotted novels involving crimes generally perpetrated by every day people that take a bit of ingenuity to catch up with the criminals. You really get a feel of how FBI agents think in order to stay ahead of the criminals. Like author James Patterson (and probably a host of other authors), each chapter is generally no more than 3 pages and view points shift between multiple characters. But it's not hard to keep everything straight (not to say it's simple-minded) and, unlike Patterson, the story does not go off the rails with complete stupidity. However, there are two things that I found disappointing in this particular book. The first is that we never get a sense as to why the main criminal is doing what he was doing. That is what made the first two books so great. You could relate to why the criminals did what they did. It's not like a John Sandford novel where we get a psycho and just go from there. Usually it's money related, but in this case, there was really no good reason for the main criminal to have a killer-for-hire business. I thought we would learn more at the end, but we do not. Plus, there is a murder towards the beginning that is a bit puzzling that is never explained. The second thing I didn't like was the exploration of feelings between Stevens and Windmere. They never seemed like they should have feelings for each other to begin with and while they briefly flirted in the other two books, it gets annoying in this one. Luckily, it appears that flirting may be over and Stevens remains happily married. Earlier this year I read John Sandford's "Shadow Prey" and almost the entire book was devoted to a relationship between the main character and a female cop. I can barely remember the plot. The criminals were completely forgettable. Terrible book. 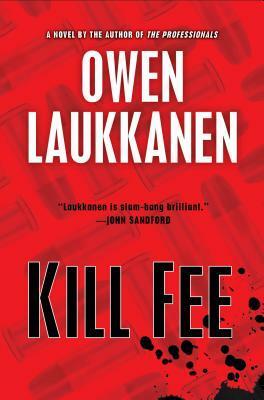 Kill Fee by Owen Laukkanen is the third Stevens and Windermere book and it’s clear Laukkanen has found a winning formula. The brilliance of the series is how simultaneously ordinary and extraordinary the criminals are. The criminals are not from bad families or raised on the street types. They are ordinary, sometimes affluent, people you might interact with every day. Something has clicked in their life to make them step outside the law and they discover that they not only have a gift for crime, Kill Fee by Owen Laukkanen is the third Stevens and Windermere book and it’s clear Laukkanen has found a winning formula. The brilliance of the series is how simultaneously ordinary and extraordinary the criminals are. The criminals are not from bad families or raised on the street types. They are ordinary, sometimes affluent, people you might interact with every day. Something has clicked in their life to make them step outside the law and they discover that they not only have a gift for crime, but a taste for it. Kill Fee starts with Stevens and Windermere having a casual lunch when a billionaire is gunned down by a sniper right in front of them. This begins a chase for the shooter which uncovers a high-tech murder for hire scheme. Stevens works cold cases for the Minnesota Bureau of Criminal Apprehension. Despite being happily married to a wife who would prefer he stay out of harm’s way, he is drawn to the excitement of the FBI and Agent Carla Windermere. Kill Fee takes the two agents from Minneapolis to Miami to Philadelphia and Las Vegas. Their skills truly complement each other. Windermere is dogged and thorough and Stevens is insightful and imaginative. The mastermind behind the kill for hire scheme is meticulous and careful. One wrong move could provide the thread that unravels everything he has worked for. Laukkanen provides plenty of action with gunfights and car chases, but where he truly excels is in creating that sense of the noose slowly drawing close around the neck of the criminal as their options and avenues of escape dwindle one by one. He spends a lot of time letting you get to know the criminals as well as the cops, so even if you don’t exactly feel sorry for them, you understand them. The odd sexual chemistry between Stevens and Windermere is the one puzzling thing to this book and the series to date. It would be one thing if Stevens weren’t so happily married, but he takes pains to show that he is. That makes the attraction and mutual temptation with Windermere just this side of creepy. Kill Fee is perhaps the most complete and skilled work by Laukkanen so far. If you like fast-paced action with skilled cops and robbers, you’ll love this book. I look forward to many more entries in this series. Highly recommended. Anyway, KILL FEE is just ridiculously bad. Really, I've no idea how it's getting such high praise. I can appreciate the author was signed by a big publishing house so people who know about these things obviously believe he's talented, and I'm sure he is, but the only part of the book that I enjoyed reading was the opening few pages when a rich businessman in Minnesota is killed by a sniper. After that everything about the story is just ridiculous: the plot, the dialogue, the weird attempts at creating sexual tension between the two lead investigators, the way the author uses the TSA and DOD and casino security personnel and Texas bullet manufacturers to frustrate the investigators by refusing to help darn it (instead of actually creating and writing plot twists that are engaging and interesting), and the seemingly big breakthroughs in the investigation that supposedly show the genius of our protagonists are either ridiculous in terms of logic or so simple that it's absurd to ask readers to believe the NYPD or LAPD would have missed them (but of course they did in the book). I won this book from a contest on Goodreads. State Investigator, Kirk Stevens with the Minnesota Bureau of Criminal Apprehension for the past seventeen years sometimes teams up with FBI Special Agent Carla Windermere. Kirk enjoys getting away from his job which consists mainly working on cold cases and working alongside Carla with the FBI is always exciting. Their union has proved beneficial on past cases and they are comfortable as partners. One day as the two were enjoying a coffee on a park be I won this book from a contest on Goodreads. State Investigator, Kirk Stevens with the Minnesota Bureau of Criminal Apprehension for the past seventeen years sometimes teams up with FBI Special Agent Carla Windermere. Kirk enjoys getting away from his job which consists mainly working on cold cases and working alongside Carla with the FBI is always exciting. Their union has proved beneficial on past cases and they are comfortable as partners. One day as the two were enjoying a coffee on a park bench, they witnessed a shooting and proceeded to chase the sniper. Before they managed to get away, Carla had his plate number. When they tracked down the man who rented the car from the plate number Carla had, they immediately knew this did not look like the man they were chasing. It ended up he knew nothing and was cut lose. When a second killing happened, they went through the same thing. It was like they were looking for a needle in a haystack. Every time they thought they were close, they were blind sighted again. More killings happened in a similar manner and they knew they were dealing with a serial killer, but who and why? Then a piece of the puzzle came to light. A computer program called 'Killswitch' may be where individuals are possibly hiring people for murder! But with obstacles such as the Department of Defense and other things standing in their way, how are they ever going to catch those responsible. Tensions are building in more ways than one! While I zipped through the first two books in the Stevens & Windermere, this one took me a few weeks. Though it follows the same stacatto pattern as Laukkanen's other books -- super short chapters, some not even a full page, clipped sentences, plot rolling downhill like a giant boulder -- the flow just wasn't there. In Kill Fee, our heroes Minnesota state police detective Kirk Stevens and FBI agent Carla Windermere witness a brazen daylight assassination in downtown St. Paul. They are soon t While I zipped through the first two books in the Stevens & Windermere, this one took me a few weeks. Though it follows the same stacatto pattern as Laukkanen's other books -- super short chapters, some not even a full page, clipped sentences, plot rolling downhill like a giant boulder -- the flow just wasn't there. In Kill Fee, our heroes Minnesota state police detective Kirk Stevens and FBI agent Carla Windermere witness a brazen daylight assassination in downtown St. Paul. They are soon tracking a new kind of web entrepreneur, one who has set up a website where people can hire a murderer. Stevens and Windermere find themselves criss-crossing the country looking for both the man who has set up the site and those he uses to carry out the murders. This would have been a 10 if I could have given it that!. Being a big fan of the crime thriller genre, I was totally happy to discover a new author. Owen Laukkanen is now on my short list of writers that's in the category of " I can't wait for them to release their next new book!" "Kill Fee" had me hooked from page one, the characters were strong and likable, I even found myself pulling for the killer....and can't remember that ever happening before. A cruel, evil, greedy man stalks the vet hos This would have been a 10 if I could have given it that!. Being a big fan of the crime thriller genre, I was totally happy to discover a new author. Owen Laukkanen is now on my short list of writers that's in the category of " I can't wait for them to release their next new book!" A cruel, evil, greedy man stalks the vet hospitals looking for the young vets coming home,the ones who are all alone with no one close to them. When he find one who has been severely damaged from the war, it is easy to kidnap them and take them to his hidden lake cottage and turn them into the assassins he needs. He needs his "assets" to do the killings that he brokers through the internet on his 'killing for hire' site. What I liked about the book and what drew me to it in the first place was the setting which is in Saint Paul MN. my hometown and I always enjoy a book set where I have lived. This is book 3 in the series so, maybe had I read book one & two I would have enjoyed it more. The relationship between Kirk Stevens, Minnesota state policeman and Carla Windemere, FBI agent is a strange one. Kirk is old, paunchy and supposedly happily married to a good looking and kind woman but he kind of likes Carla, she is young and gorgeous and sleeps with a guy at work and dates a few more of them but she kind of likes him too, what? As much as I got to know Kirk, I liked him the best. Carla not so much. Her personality was odd and the way she talked wasn't very realistic to me. People start dying and it is up to Kirk and Carla to find out how these people are tied together and who wants them dead. It was interesting to get in the mind of the killer and I would recommend this to someone who wants a fast thrill read. The title of the book is Kill Fee but I think It should be called Kill Switch, which makes much more sense once you have read the book! Kill Fee is a fast moving, gritty suspense novel. It's the third in the Stevens and Windermere series, and I have not read the first two. I'm always leery about stepping blindly into a series, but I had no problems here. This book works well as a stand-alone read. The characters are interesting, though I felt I got to know Stevens much better than I did Windermere. I didn't really connect with her character. The "bad guys" are handled incredibly well and I enjoyed being inside their heads with t Kill Fee is a fast moving, gritty suspense novel. It's the third in the Stevens and Windermere series, and I have not read the first two. I'm always leery about stepping blindly into a series, but I had no problems here. This book works well as a stand-alone read. The characters are interesting, though I felt I got to know Stevens much better than I did Windermere. I didn't really connect with her character. The "bad guys" are handled incredibly well and I enjoyed being inside their heads with the action. The concept behind the plot is fascinating. I don't want to give spoilers here, so I'll just say that I wanted to go deeper into the making of the assassins. I wasn't completely sold because the details are alluded to more than shown. Still, the story held my attention and I could see it all playing out. A big part of the reason I wanted more is because I found the story so compelling. Overall, Kill Fee is a unique look at the world of hired killers that is sure to captivate suspense fans. There are lots of things to like about this book. The action starts in St. Paul, Minnesota and the last scene takes place in Rice Park. It features a really interesting pair of detectives - one from the FBI and one from the BCA in Minnesota. The story concerns making "assets" out of men who were soldiers suffering an an extreme way from PTSD and have a weak or nonexistent support system. Assets are conditioned to kill on command and are part of an organization called Killswitch. This part of the There are lots of things to like about this book. The action starts in St. Paul, Minnesota and the last scene takes place in Rice Park. It features a really interesting pair of detectives - one from the FBI and one from the BCA in Minnesota. The story concerns making "assets" out of men who were soldiers suffering an an extreme way from PTSD and have a weak or nonexistent support system. Assets are conditioned to kill on command and are part of an organization called Killswitch. This part of the story is reminiscent of The Manchurian Candidate where similar conditioning took place. I enjoyed this psychological component of the story. Owen Laukkanen's debut thriller, THE PROFESSIONALS, was published by G.P. Putnam's Sons in spring 2012. Its sequel, CRIMINAL ENTERPRISE, will hit stores on March 21, 2013. An alumnus of the University of British Columbia's Creative Writing BFA program, Laukkanen spent three years in the world of professional poker, traveling to high-stakes tournaments across the globe as a writer for www.PokerListings.com.